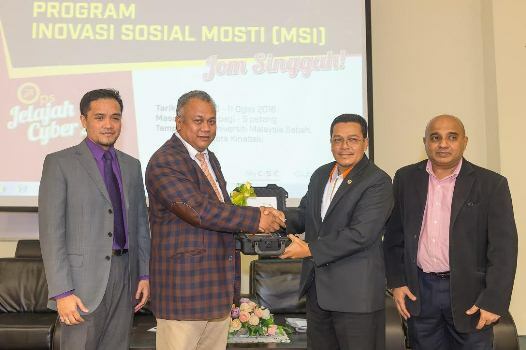 WEDNESDAY, 10 AUGUST – Universiti Malaysia Sabah (UMS) is ready to become the focal point to the Ministry of Science, Technology and Innovation (MOSTI) particularly in assisting the public in the field of computer and cyber. Deputy Vice-Chancellor (Research and Innovation), Professor Dr. Shahril Yusof said, it was based on the facilities and infrastructure in addition to adequate human resources to assist in ensuring computer literacy among the community in line with the demands of current times. “As a Public University (UA) in Sabah and based on the National Blue Ocean Strategy (NBOS), UMS is ready to cooperate besides being the focal point to MOSTI. “The university has the infrastructure, facilities, students, lecturers as well as campuses in Sandakan, Labuan and Sikuati Kudat, that are sufficient to fulfill the requirements of carrying out this mission,” he said, after launching the ‘Ops Jelajah Cyber 2.0’ (Explore Cyber Operation 2.0) Sabah Edition at the Lecture Hall Complex, today.